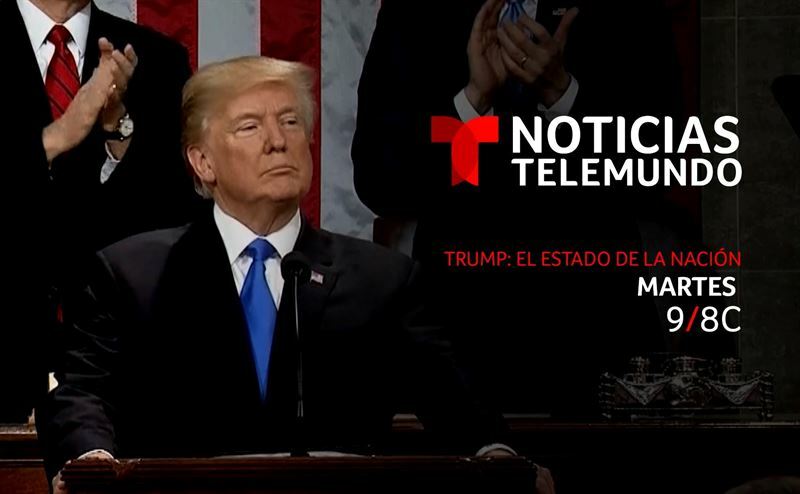 Miami -February 4, 2019- Noticias Telemundo announced the broadcast of “Trump, the State of the Union” on Tuesday, February 5, live from coast to coast at 9 p.m. ET/8 CT/6 PT. Noticias Telemundo Anchor José Díaz-Balart will lead the coverage of President Donald Trump’s State of the Union Address in the company of former Republican congressman Carlos Curbelo, former Secretary of Labor during the Obama administration, Hilda Solis, and Noticias Telemundo Senior Correspondent Lori Montenegro. The president’s speech will be translated simultaneously into Spanish and will stream live on NoticiasTelemundo.com and Noticias Telemundo’s Facebook, YouTube and Twitter accounts, as well as via the Noticias Telemundo mobile app. Noticias Telemundo will also broadcast the Democratic response in Spanish language by California Attorney General Xavier Becerra. “Noticias Telemundo” is a leading news provider for U.S. Hispanics. Its award-winning television news broadcasts, airing from the Telemundo Center, include the daily newscast “Noticias Telemundo” with José Díaz Balart, “Noticias Telemundo Fin de Semana” with Julio Vaqueiro, “Noticias Telemundo Mediodía” with Felicidad Aveleyra, the “Un Nuevo Día” news segment with Paulina Sodi, and the Sunday current affairs show “Enfoque con José Díaz-Balart.” The “Noticias Telemundo Digital Team” provides uninterrupted content to U.S. Hispanics via its growing online and mobile platforms. “Noticias Telemundo Investiga" produces investigations, reports and in-depth documentaries. “Noticias Telemundo” also airs news specials, documentaries and news events such as political debates, forums and town halls.